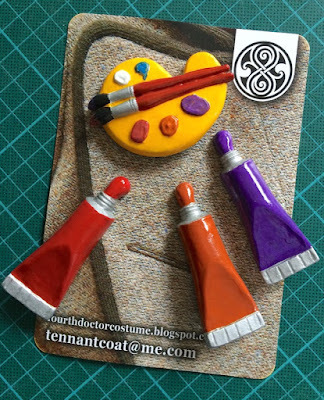 Making My 4th Doctor Costume: Palette brooch set - custom colours! Palette brooch set - custom colours! In association with artist Susan Trevor (who made the screen-worn cat brooch for Colin Baker’s debut as the Sixth Doctor) I have been offering the City Of Death style palette brooch set for a while now. Recently I had an unusual request from a client. Could the tubes of paint be in the three colours of the season 18 scarf so it could be worn with that costume instead? 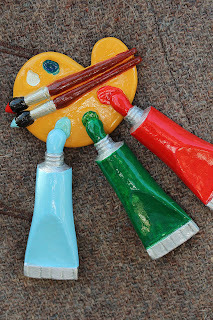 Well, anything is possible, so I arranged with Susan to do a special custom paint job in the next batch of brooches I ordered from her. The photos from season 18 aren't always that great for colour reference. They are often mirky or you cannot see much difference between the colours on the scarf itself. 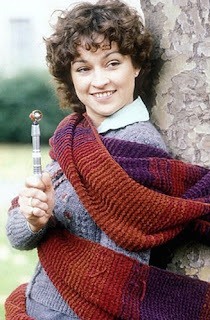 I did, however, find this image of Janet Fielding with the scarf which has good colour and definition. Well, today the brooches arrived, including the special one-off in season 18 colours! I think it’s come out rather well. I hope the client likes it! While it's not something I am able to do yet, at some point in the future I'd certainly be interested in getting a 4th Doctor's Season 12 Corduroy Shooting Jacket and/or The Season 13/14 Burgundy Velvet Frock Coat and/or The Season 13 Grey Tweed Frock Coat. I'm wondering if it's (like I said in the future) something that you'd consider doing. Yes - I just need a serious buyer and I can look at making these for real. Good to know for future reference!